You are here: Home / Uncategorized / Presentation on ‘What Is CETA?’, AV Room, Dáil Éireann. Tuesday 23rd May, 2017. Barry Finnegan is a programme director and senior lecturer at the Faculty of Journalism & Media Communications, Griffith College. 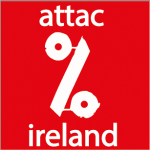 He is also a researcher with the Irish branch of the international civil society organisation, ATTAC (the Association for the Taxation of financial Transaction for the Aid of Citizens). 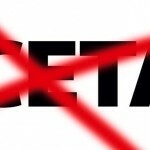 What, in reality, does CETA contain and what can be consigned to spin and myth? What will be the implications of ratifying, or not ratifying, the agreement? 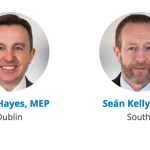 How and when will the Houses of the Oireachtas be asked to ratify CETA? How can we inform ourselves more accurately, as a parliament, before making this decision? CETA = ‘Comprehensive Economic Trade Agreement’ is a ‘new generation’ free investment and free trade agreement between the EU and Canada. Water is not-excluded from CETA. 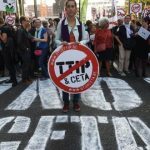 CETA: no jobs and bad for workers’ rights. Chapter Four of CETA incorporates the ‘TBT Agreement’ (Agreement on Technical Barriers to Trade) contained in Annex 1A to the WTO Agreement. Article 4.3 ‘Cooperation’ of CETA obliges the parties to “strengthen their cooperation in the areas of technical regulations, standard”. Article 4.7 ‘Management of the Chapter’ allows the CETA Joint Committee “to amend this Chapter”. Ensure that the Parties’ sanitary and phytosanitary (“SPS”) measures do not create unjustified barriers to trade. Establishment of 19 Regulatory Cooperation Committees reporting to Joint CETA Committee. Abandoning the ‘precautionary principle’ – a core aspect of EU governance. Not ratifying the agreement will mean continued positive trade relations with Canada and the preservation of the Irish and EU democratic system. Voting for, and ratifying the CETA, will lead to an unprecedented alteration of our societies, with corporations elevated to level playing with governments. The ICS (Investor Court System) in CETA, is in all but name and minor technical issues, the same as Investor-State Dispute Settlement (ISDS). 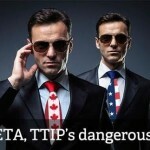 The ICS (ISDS) private court for corporations is illegal under EU law. Commission employees claim ICS is illegal. German Magistrates’ Association says: ICS illegal & unnecessary. European Association of Judges says: ICS unnecessary, arbitrators’ appointments do not meet minimum standards for judicial office, questionable if EU has legal right to set up ICS. 101 law professors: ICS incompatible with EU legal order. 122 legal scholars petition European Commission to reject private arbitration in ‘trade’ deals. EU’s European Economic and Social Committee: ICS incompatible with EU Charter of Fundamental Rights, ECJ must rule on its legality. European Commission’s legal services: “discrimination based on nationality is incompatible with EU law”. No progress so far: Testing the legality of ICS (ISDS) at the European Court of Justice (ECJ). Feb. 2016: European Commission refuses to publish legal advice it received on whether ICS (ISDS) is compatible with EU law. Oct. 2016: Belgian government “agrees” to test legality of ICS (ISDS) at ECJ; but doesn’t say “when”. Nov. 2016: European Parliament rejects resolution to test legality of ICS (ISDS) at ECJ. Using Article 218.11 of EU law, Ireland could ask ECJ to rule on legality of ICS (ISDS). (a) ECJ Background: Ruling 1/09 (rejection of a European Patent Court). (b) ECJ Background: Ruling 2/13 (rejection of the European Court of Human Rights). ECJ rules that all trade deals which contain, (a) private investor-protection ‘court’ (ICS/ISDS) and (b) ‘non-direct investment’ component, can only be fully legally adopted after all member state parliaments agree. This is entirely up to Fine Gael. The vast majority of the contents of CETA will be “provisionally applied” (most likely) on July 1st 2017. If they feel they might lose the vote, Fine Gael may simply not ask the Dáil to vote and just continue with CETA “provisional application” without the corporate enforcement mechanism of the ICS (ISDS). It will most likely take two more years for all member state parliaments to vote on CETA. If there is a vote, it will be on the whole agreement including the ICS (ISDS) component.